PRESS RELEASE: Need a full orchestra for less than £100? Or a drumkit that perfectly suits your genre of music for only £50? How about a vocalist who's available whenever you need them? Thanks to a huge portfolio of over 50 of the world's top soundware brands including Spectrasonics, Toontrack, Rob Papen, Synthogy, Loopmasters, Sample Magic and Zero-G, Time+Space can provide the instruments and sounds you need for any type of music track or audio project. 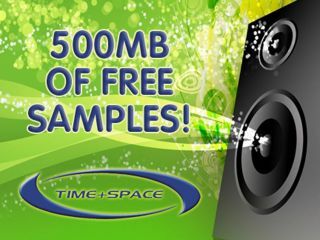 Right now, when you sign-up to the Time+Space weekly newsletter, you'll get access to a link from which you can download over 500MB of samples taken from an abundance of top sample libraries - absolutely free! To register visit: https://www.timespace.com/account/login.php and make sure you tick the 'Receive newsletter' box to enable the free download link.